This is a great alternative to dairy-laden gratins. I use stock instead of the usual cream for the liquid. I like to use a little aged cheese, such as Gruyere or Parmesan, but this recipe is also great without. It was a huge hit with my family! Rub 2-quart baking dish with garlic clove until garlic releases oil. Sauté onions in olive oil until they become translucent. Add thyme, then garlic 30 seconds later. Sauté for a minute or two. Add wine and cook down (5 ish minutes). Transfer 1/3 of the onions to the baking dish. Mix the rest of the onions with cheese (if using), salt, pepper, and most of the roots in a large bowl. Pour mixture into gratin dish over onions. Compress mixture with your hand, then layer the remaining roots in neat rows on top of the mixture. Add hot stock until it comes ¾ of the way up the baking dish. Bake for an hour or more, uncovered, until the potatoes are tender. They should be easily pierced by a knife tip. If liquid still remains, bake a little longer. Optional, sprinkle more cheese on top in the last 10 minutes of cooking. This dish is an excellent complement to Brussels sprouts, roasted chicken, or garlicky kale. 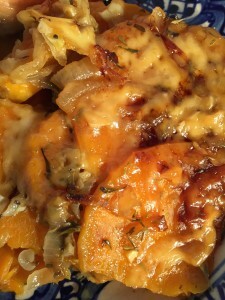 This entry was posted in Main courses, Recipes, Side dishes and tagged sweet potatoes, vegetables. Bookmark the permalink. Both comments and trackbacks are currently closed.